"Calico bush" redirects here. For the Rachel Field novel, see Calico Bush (novel). Kalmia latifolia, commonly called mountain laurel, calico-bush, or spoonwood, is a broadleaved evergreen shrub in the heather family, Ericaceae, that is native to the eastern United States. Its range stretches from southern Maine south to northern Florida, and west to Indiana and Louisiana. 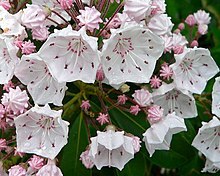 Mountain laurel is the state flower of Connecticut and Pennsylvania. It is the namesake of Laurel County in Kentucky and the city of Laurel, Mississippi (founded 1882). It is an evergreen shrub growing to 3–9 m tall. The leaves are 3–12 cm long and 1–4 cm wide. Its flowers are round, ranging from light pink to white, and occur in clusters. There are several named cultivars today that have darker shades of pink, near red and maroon pigment. It blooms in May and June. All parts of the plant are poisonous. Roots are fibrous and matted. The plant is naturally found on rocky slopes and mountainous forest areas. It thrives in acidic soil, preferring a soil pH in the 4.5 to 5.5 range. The plant often grows in large thickets, covering great areas of forest floor. 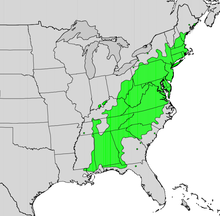 In the Appalachians, it can become tree-sized but is a shrub farther north. The species is a frequent component of oak-heath forests. In low, wet areas, it grows densely, but in dry uplands has a more sparse form. Kalmia latifolia is notable for its unusual method of dispensing its pollen. As the flower grows, the filaments of its stamens are bent and brought into tension. When an insect lands on the flower, the tension is released, catapulting the pollen forcefully onto the insect. Experiments have shown the flower capable of flinging its pollen up to 15 cm. Physicist Lyman J. Briggs became fascinated with this phenomenon in the 1950s after his retirement from the National Bureau of Standards and conducted a series of experiments in order to explain it. It is also known as ivybush or spoonwood (because Native Americans used to make their spoons out of it). The plant was first recorded in America in 1624, but it was named after the Finnish explorer and botanist Pehr Kalm (1716–1779), who sent samples to Linnaeus. The Latin specific epithet latifolia means "with broad leaves" – as opposed to its sister species Kalmia angustifolia, "with narrow leaves". The plant was originally brought to Europe as an ornamental plant during the 18th century. It is still widely grown for its attractive flowers and year round evergreen leaves. Elliptic, alternate, leathery, glossy evergreen leaves (to 5" long) are dark green above and yellow green beneath and reminiscent to the leaves of rhododendrons. All parts of this plant are toxic if ingested. Numerous cultivars have been selected with varying flower color. Many of the cultivars have originated from the Connecticut Experiment Station in Hamden and from the plant breeding of Dr. Richard Jaynes. Jaynes has numerous named varieties that he has created and is considered the world's authority on Kalmia latifolia. The wood of the mountain laurel is heavy and strong but brittle, with a close, straight grain. It has never been a viable commercial crop as it does not grow large enough, yet it is suitable for wreaths, furniture, bowls and other household items. It was used in the early 19th century in wooden-works clocks. Root burls were used for pipe bowls in place of imported briar burls unattainable during World War II. It can be used for handrails or guard rails. Mountain laurel is poisonous to several different animals, including horses, goats, cattle, deer, monkeys, and humans, due to grayanotoxin and arbutin. The green parts of the plant, flowers, twigs, and pollen are all toxic, including food products made from them, such as toxic honey that may produce neurotoxic and gastrointestinal symptoms in humans eating more than a modest amount. Symptoms of toxicity begin to appear about 6 hours following ingestion. Symptoms include irregular or difficulty breathing, anorexia, repeated swallowing, profuse salivation, watering of the eyes and nose, cardiac distress, incoordination, depression, vomiting, frequent defecation, weakness, convulsions, paralysis, coma, and eventually death. Necropsy of animals who have died from spoonwood poisoning show gastrointestinal hemorrhage. The Cherokee use the plant as an analgesic, placing an infusion of leaves on scratches made over location of the pain. They also rub the bristly edges of ten to twelve leaves over the skin for rheumatism, crush the leaves to rub brier scratches, use an infusion as a wash "to get rid of pests", use a compound as a liniment, rub leaf ooze into the scratched skin of ball players to prevent cramps, and use a leaf salve for healing. They also use the wood for carving. The Hudson Bay Cree use a decoction of the leaves for diarrhea, but consider the plant to be poisonous. ^ a b c "Kalmia latifolia". Germplasm Resources Information Network (GRIN). Agricultural Research Service (ARS), United States Department of Agriculture (USDA). Retrieved 12 December 2017. ^ a b Keeler, Harriet L. (1900). Our Native Trees and How to Identify Them. New York: Charles Scribner's Sons. pp. 186–189. ^ McNabb, W. Henry. "Kalmia latifolia L." (PDF). United States Forest Service. United States Department of Agriculture. Retrieved 27 April 2015. ^ Nimmo, John R.; Hermann, Paula M.; Kirkham, M. B.; Landa, Edward R. (2014). "Pollen Dispersal by Catapult: Experiments of Lyman J. Briggs on the Flower of Mountain Laurel". Physics in Perspective. 16 (3): 383. doi:10.1007/s00016-014-0141-9. ^ Nimmo, John R.; Hermann, Paula M.; Kirkham, M. B.; Landa, Edward R. (2014). "Pollen Dispersal by Catapult: Experiments of Lyman J. Briggs on the Flower of Mountain Laurel". Physics in Perspective. 16 (3): 371–389. doi:10.1007/s00016-014-0141-9. ^ Morrissey, Laurie D. "Mountain Laurel". northernwoodlands.org. Center for Northern Woodlands Education. Retrieved 16 June 2018. ^ "Kalmia latifolia". missouribotanicalgarden.org. Missouri Botanical Garden. Retrieved 16 June 2018. ^ Shreet, Sharon (April–May 1996). "Mountain Laurel". Flower and Garden Magazine. Archived from the original on 2012-05-26. ^ Jaynes, Richard A. (1997). Kalmia: Mountain Laurel and Related Species. Portland, OR: Timber Press. ISBN 978-0-88192-367-4. ^ "RHS Plantfinder – Kalmia latifolia 'Freckles'". Retrieved 16 March 2018. ^ "RHS Plantfinder – Kalmia latifolia 'Little Linda'". Retrieved 16 March 2018. ^ "RHS Plantfinder – Kalmia latifolia 'Olympic Fire'". Retrieved 16 March 2018. ^ "RHS Plant Selector – Kalmia latifolia 'Pink Charm'". Retrieved 15 July 2013. ^ a b "Species: Kalmia latifolia". Fire Effects Information Service. United States Forest Service. Retrieved Oct 3, 2011. ^ a b "Mountain Laurel". Wood Magazine.com. 2001-10-29. Retrieved Oct 3, 2011. ^ Galbraith, Gene (September 12, 2006). "The legacy of the Ogee Clock". Retrieved October 3, 2011. ^ "Mountain Laurel". ASPCA. Retrieved Oct 3, 2011. ^ Horton, Jenner L.; Edge, W.Daniel (July 1994). "Deer-resistant Ornamental Plants" (PDF). Oregon State University Extension. Archived from the original (PDF) on 2013-01-13. Retrieved Oct 3, 2011. ^ a b c d "Kalmia latifolia". University of Pennsylvania School of Veterinary Medicine. Retrieved Oct 3, 2011. ^ a b "Grayanotoxin". Bad Bug Book. U.S. Food and Drug Administration. May 4, 2009. Archived from the original on March 14, 2010. Retrieved Oct 7, 2011. ^ a b c Russell, Alice B.; Hardin, James W.; Grand, Larry; Fraser, Angela. "Poisonous Plants: Kalmia latifolia". Poisonous Plants of North Carolina. North Carolina State University. Archived from the original on 2013-01-13. Retrieved Oct 3, 2011.